PUBLISHED IN: First edition – 2011. Revised edition – 2014. THE PUBLISHER: Horned Helmet Books. SUMMARY: Long-haired Scottish metal vocalist Spark MacDubh drops dead on a snow-covered street of his native Bronzehall, only to be jolted back to life by what he describes as “lightning from Heaven”. After Spark’s resurrection his sanity is stretched thin. During waking hours he receives instructions from mysterious deities. At night he is haunted by a Devil who wields ultimate power over the music industry, promising musical success on one condition: acquisition of musicians’ souls. Unwilling to sacrifice his soul or those of his bandmates, MacDubh comes up with an alternate route to stardom: put the Devil out of business. The idea is far from practical. For starters, it requires a trip to Hell, and only the right music can open the gateway to that dimension. Catch-22? More like Catch-666. THE BACKSTORY: I decided to write Metallic Dreams after receiving the advice write the book you’d love to read. 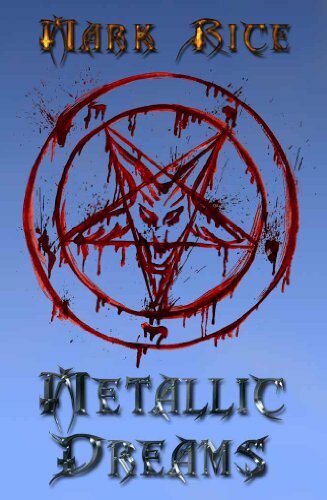 So I set out to create a quintessentially Scottish, relentless, funny, poignant, philosophical work of fantasy: the definitive (and at that time, the only) chunk of heavy-metal literary fiction. Research wasn’t necessary, as I’d been immersed in music since early childhood. Also, I was fortunate to have grown up steeped in myth, legend and folklore. (In Metallic Dreams the old blues Crossroads folklore is given a much-needed overhaul.) Throughout, I stuck to the the write what you know adage. That’s not the only way to write, but it’s the best way of creating literature that comes across as authentic. The first draft (250,000 words) took one year to write. Editing took two more years, by which time the book had been whittled down to 172,000 words. I spent a further six months (late 2013/early 2014) creating the revised edition. WHY THIS TITLE? : The story explores the damage five adolescents inadvertently do to themselves by splitting up their metal band and giving up their musical dreams. It also charts the healing that happens more than a decade later, when those five damaged individuals are brought together again. Forced to remember their shared dream, they have to choose one of two possible paths: revive their dream or keep it buried. The story’s ideological backbone: it’s important to nurture those dreams that flow from the soul. Metallic Dreams struck me as the perfect title. WHY WOULD SOMEONE WANT TO READ IT? Because it’s innovative, original and entertaining. I’m biased, of course, but I’m the one answering the question so there you have it. The story is rich in folklore, fantasy and humour. I didn’t follow a blueprint or attempt to jump onto any bandwagon (even the thought makes me wince). Rather, I strove to create something fresh. Metallic Dreams has been enjoyed by readers of myriad genres, among them epic fantasy, magical realism, sci-fi, Scottish fiction, and poetry. A love of heavy metal isn’t mandatory in order to enjoy the book (many non-metallists have loved it), but readers who are also metal fans will understand some nuances and in-jokes that’ll go over the heads of others. REVIEW COMMENTS: The book has received reviews across a variety of media. Below are five of my favourite review snippets, starting with the one that made me laugh the most. Snippet #1: “Mark Rice should be kicked in the gonads for writing Metallic Dreams.” – Scottish poet James Scott Pettigrew. AUTHOR PROFILE: I grew up in a house with no TV (my father reckoned television stifled creativity). The house was full to the gunnels with books, music and musical instruments. In these I found endless enjoyment. By the time I started primary school at age 5, my father had taught me to read to a near-adult level. He had also taught me to both read and play music. So poetry, literature and music have been constants in my life. Although I started writing stories at age 5, reading Douglas Adams’s The Hitchhiker’s Guide to the Galaxy at age 10 awakened me to the possibility of creating a story that epic, in which profundity and preposterousness seamlessly co-exist. After all, why write just things when you could write epic, philosophically insightful things? To stay balanced, I punch, kick, knee and elbow people (consensually – also known as Muay Thai), as well as lifting heavy things, hill-walking, climbing, swimming, and mountain-biking with my best pal Shilo the wolfdog galloping alongside. The healthy body, healthy mind philosophy is 100% correct. A body can’t achieve optimum health without a strong mind. The converse is also true. Exercise is amazing at boosting endorphin levels and decreasing stress. Writing has to be a sedentary activity, so balance is required. Too much sitting on one’s arse is conducive to nothing except growing a bigger arse. AUTHOR COMMENTS: Distilled down to its essence, the ideological crux of Metallic Dreams is threefold: (1) hold friends sacred; (2) trust your heart; (3) follow your true path regardless of the opposition. SAMPLE CHAPTER: Samples of Metallic Dreams and my other books are available via Amazon’s ‘Look Inside’ feature. 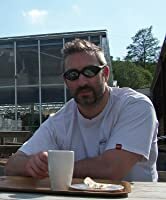 My Amazon author page – www.amazon.com/Mark-Rice/e/B004ZNBL38/ref=dp_byline_cont_book_1. LOCAL OUTLETS: The paperback is available from some Scottish branches of Waterstone’s. WHERE ELSE TO BUY IT: Online the paperback is available from Amazon (global link http://mybook.to/MRMD) and Lulu (http://www.lulu.com/shop/mark-rice/metallic-dreams/paperback/product-21918538.html). Lulu print quality, especially where covers are concerned, is superior to Amazon’s. The e-book is available exclusively from Amazon (global link http://mybook.to/MRMD). PRICE: Paperback £11.99. E-book £3.99. Outside the UK, prices are equivalent to UK cost. CONTACT THE AUTHOR: Feel free to connect with me online. I’m always happy to hear readers’ thoughts.